ProQuest RefWorks (formerly Flow) is a cloud-based tool that integrates with Summon, and allows you to save your Summon search results in a permanent, cloud-based folder. 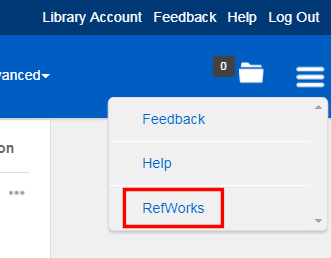 RefWorks allows sharing of collections between other RefWorks users, and the creation of bibliographies in various reference styles including APA 6th. RefWorks integrates with Summon, and can be accessed by using the link at the top right of your Summon search results (see screenshot). Alternatively, you can log into RefWorks directly at refworks.proquest.com. You will need to register for a free account to use RefWorks. RefWorks is free to use so long as you sign up with your University email address. A Write-N-Cite plugin-in, which allows you automatically generate references from your RefWorks folder while you write in Word, is available on the Library computers. You can also download this for your own computer by going to the Tools section within your RefWorks account. Where can I get help with RefWorks? An online user guide is available, along with a series of video guides, produced by ProQuest. The librarians can also advise on using RefWorks: simply ask at the help desk any time during staffed hours. You do not need an appointment. The library runs occasional workshops on using RefWorks. See our dissertation survival guide for upcoming workshop dates when available. This RefWorks workbook is used on these workshops, you may find it useful to go through if you are unable to attend a workshop.